Boris Johnson last night insisted the Brexit deal can be renegotiated without delaying Britain’s departure from the bloc. The former foreign secretary said he did not ‘rejoice’ in the massive defeat suffered by Theresa May, but demanded that she ditches the Irish border backstop and takes a ‘fresh approach’. He dismissed the idea that would mean extending the Article 50 process, which has just 10 weeks left to run, saying most of the other terms were ‘fine’. Mr Johnson also confirmed that he will back the PM in a no-confidence vote being called by Jeremy Corbyn tonight. 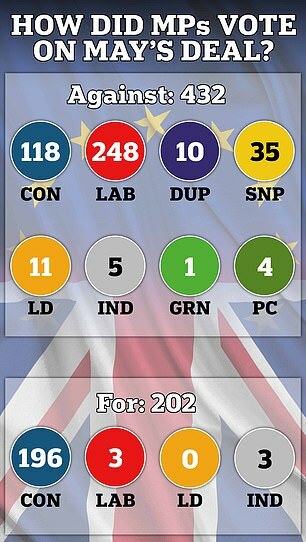 Mrs May’s has been left clinging on to power by her fingernails after 118 Tory rebels joined forces with Labour to trounce her Brexit plan by 432 votes to 202. The majority of 230 was by far the biggest on record, higher than the 166 defeat for the Labour minority government in 1924. Rising to her feet moments after the drubbing, a clearly shaken Mrs May said the government will now ‘listen’. Mr Johnson told Sky News that the margin of defeat was ‘bigger than I expected’. ‘It’s no particular cause for rejoicing for me, after all I’ve been trying for so long to get the government back in the place the PM was in her Lancaster House speech last year,’ he said. ‘We were really talking about taking advantage of free trade deals and taking control of our laws. ‘All that got lost as we moved into this quicksand of the backstop, locked into the customs union and single market. ‘What she has now is a massive mandate. 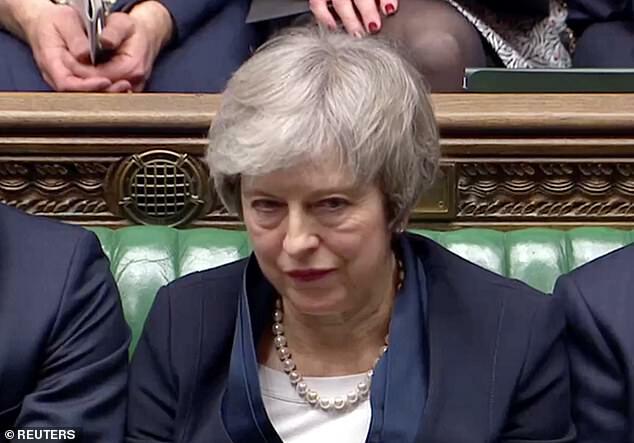 With 432 votes against her deal, she takes it back to Brussels and says “we can’t do this deal as it is, we need a fresh approach.” We can keep the good bits, protecting rights of the 3.2million EU citizens here in UK. Challenged that to change the Withdrawal Agreement the Article 50 process will need to be extended beyond the end of March, he said: ‘You don’t need to extend Article 50 at all, there are bits of the Withdrawal Agrereement that are fine. ‘She should take out, excise, surgically remove the backstop. ‘That’s the problem, that’s the lobster pot, that’s the trap that keeps us locked in the customs union. ‘We had this terrible Hobson’s choice between sacrificing Northern Ireland or remaining subject to the EU without having any say in the EU. That’s the trap, and it needs to come out. ‘Then we use the implementation period to do the free trade agreement. That’s eminently doable – when you consider the UK and EU are completely aligned. 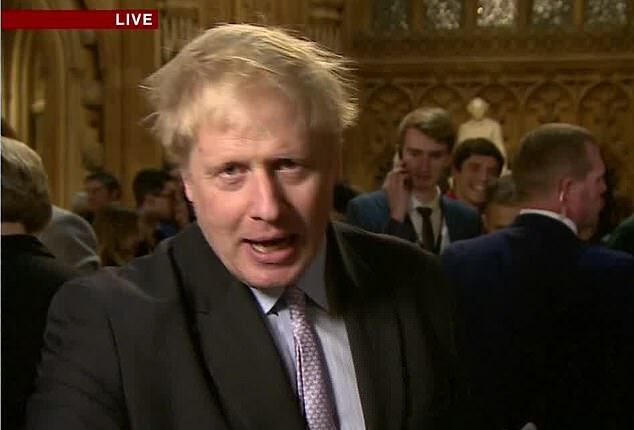 Asked whether he would support Mrs May tonight, Mr Johnson said last night: ‘We in the conservative party went through that in December last year. That’s not the issue.